Breakfast and dinner! Located in a quiet area near the beach (5 minutes walk from centre of Fort Cochin), it is ideal for groups of friends and families, coming for a holiday to Kerala. You can connect your laptop and use free wireless broadband internet wherever you choose or relax in the lounge on the large sofas and enjoy 60 channels of satellite TV. The apartment is light and airy with large windows and mosquito nets. Maximum group of 6. Extra Bed will be charged. House keeping services are provided on alternate days. You can get your laundry done for extra charges. Spacious service apartments overlooking the Arabian Sea with large roof terrace with plenty of space for yoga, sunbath and restaurant facilities. Great Kerala cuisine available at your own apartment or roof space giving the ambience of a nice serene blossom garden Alternatively, practice your Kerala cooking in the fully equipped kitchen. It is ideal for groups, friends and families. Fort Cochin is a good base for exploring Kerala: stunning Marari Beach is only 1 hour drive, Allepey Backwaters and renowned Houseboats - 1, 2 hours drive, Munnar - 3, 5 hours drive, Periyar and other Wildlife Sanctuaries within 5 hours. inen and towels changed every alternate days upon room service,. Spacious Living with a flat TV and comfortable sofas. Full Fledge kitchen with necessary utensils where you can tryout different cuisines. Dining area is near to kitchen wherby you can serve food easily after cooking. sattelite TV available withg world wide channels. 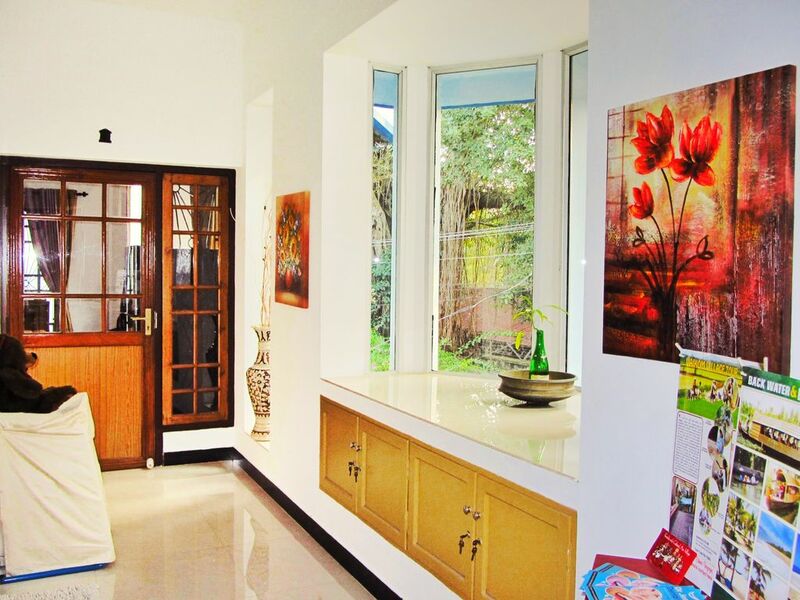 Library is arranged with wide range of books at the property, whereby book lovers can spend time reading books. A wonderful garden is attached to the apartment which enriches the ambience of the apartment and terrace. Cosy terrace having a garden and Seaview,where you can spend time morning for brekfast.yoga and exercise and also during evening. Notes on accommodation: Please, CALL US at least 24 hours in advance when you arrive in India/Kerala, and BEFORE you arrive to the apartment to receive your exact check in time and get directions to the apartment. The apartment was very comfortable with a well equipped kitchen and large living room. It was lovely to have breakfast upstairs in the roof garden. The owner was always very helpful and friendly, with a constant supply of bottled water on hand whenever we needed it. The main area of Fort Cochin is only a short walk away and there are some very good restaurants nearby. The three nights we spent there were very comfortable: an excellent start to our holiday in Kerala! Ayurvedic massages, Yoga Classes, Cooking Classes etc are available. There are Art exhibitions, Kathakali plays, traditional kerala dance shows etc for the tourist. 200 m to the city beach in Fort Cochin (not for swimming). About 60 km to Marari Beach (South of Cochin) - Highly Recommended! By Air - a taxi from Cochin International airport (1,5 h, rate 1200 INR). Taxi can be arranged on request. By Train – from Ernakulam railway station get a rickshaw to the ferry station, take a boat Ernakulam-Fort Kochi (20 min) and then again rickshaw or car to Maritime Museum (30-50 INR). Or get a rickshaw from the train station to Fort Cochin up to Dronacharya/Maritime Museum (about 30 min, rate about 200-300 INR). Walking distance to the centre of Fort Cochin - 10 minutes. Matancherry - 15 minutes by rickshaw or 20 min by bike. Ernakulam - 30-40 minutes by taxi or 20 minutes by Ferry. The Jewish Synagogue in Mattanchery, The Dutch Palace, the famous Jew town antique market, an art shopper’s paradise are only 5km from the Seaview Apartment, less than 15 minutes by rickshaw.